Wanna go on vacation but feel Cozy as if your home? 🦎We got the place for you! A 2 bedroom,1 bathroom with living room,dining room and kitchenette in a secure gated community of Venture Out.Fully furnished,Colorful & great island vibe. This is a Florida lovers Paradise. This dry lot home sleeps 6.The house is fully furnished with a colorful island vibe. 2 bedroom and 1 bathroom.There is two twins bed in the bottom floor bedroom,along with AC & a flat screen TV. One full pull out couch in the living room with a flat screen TV and AC unit. .As you make your way through the kitchenette there is a twin bed in its own part of the hallway. The back bedroom has a Full bed with a AC unit. 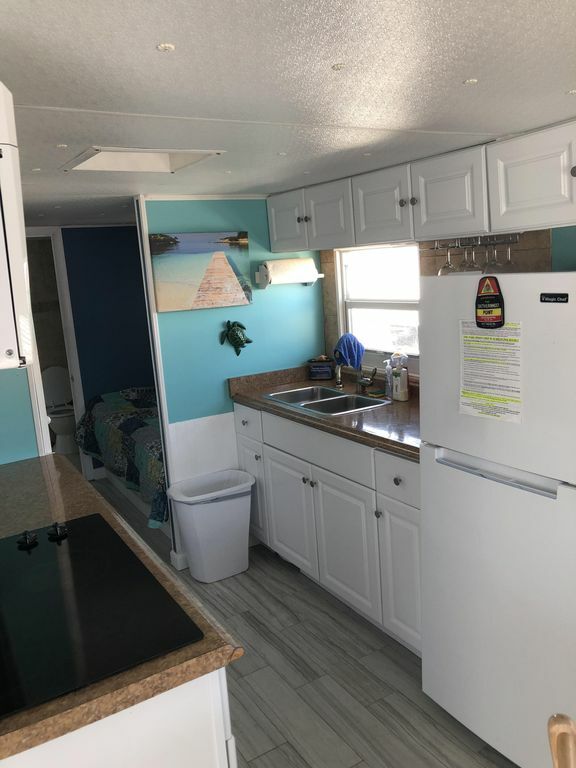 The decoration in all the rooms give you that feel of paradise.The kitchenette has a 4 person sitting area.While there is also a turquoise table out front to enjoy your morning coffee or nice grilled steak.There is a grill on the side of the house. The house is in a secured gated community called Venture Out,which is a 64 acre property. Please note, a additional one time charge (not included in your total) of $53.75 is paid at gate time of arrival. That charge is to use all the amenities that Venture out has to offer which are all walking distance from the house. It includes boat ramp,fueling station,a convenient store(open 7 days a week)- the store alone has all last minute things you need from beer,food,snacks, toiletries,bait & ice,80 ft heated pool(with ocean views) a children’s swimming area,hot tub,tied off saltwater swimming(next to the pool) with tiki huts to picnic under,washer & dryer units, and extra bathhouses & bathrooms. If your into certain sports or activities V.O has you covered also with a tennis court & basket ball court. Along with the recreation building that has a library, pool tables,dart boards & ping pong and also WiFi! Depending on the time of year the Pavilion has all different activities also from Pancake Breakfast,Church,Movies,Musicals,Swimming,Yoga,Line dancing etc! Cudjoe Key is 20 miles from Key west. It is in between Sugarloaf Key and Summerland Key and not far from Big Pine Key or Marathon. All year long there are different events, holidays,festivals,fishing tournaments, lobster season,boat races,fantasy fest etc. 🌞The house has mostly everything you need,except one thing... that’s you! A Jersey family with a huge heart for the Florida sun. Window units in both bedrooms & the living room. blankets,sheets & pillow cases provided for every bed. Extras in linens also in closet. One car driveway. Any overflow parking will be in the lot walking distance from the house. Please bring your own beach/boat towels. Tv in back bedroom and living room. *in the resort*-part of your V.O fee. We had a great stay at the beach house! The community has a nice heated pool, plus ping pong, puzzles, and WiFi access in the rec hall for rainy days (luckily we only had one). Great neighbors and convenient to Key West and other islands. On the whole, an adequate place to stay. We enjoyed our visit to Cudjoe Key. The house was clean when we arrived. It had a couple of issues. The dishwasher was not working, the toilet paper holder in the bathroom was broken and the paper kept falling on the floor, and the water pressure in the shower fluctuated quite a bit. Otherwise, it suited our needs. We were out of the resort most of the time, so we weren’t able to enjoy the amenities, but they seemed quite nice. Thank you, Shawna for being so responsive. Overall, it was a positive experience. My husband took me and our three kids to the Keys for my birthday! It was fabulous! Shawna’s place was perfect for us! It was very updated. The location is great we could get to Key West in about 25 minutes. We enjoyed the Venture Out community as well! Very quiet and laid back. We all enjoyed the pool area. We will definitely stay here again!!! The owner was very responsive if we had any questions. The accomodation is in a pristine gated community with big pool, flood lit tennis courts, rec room, store and water front. 20mins out of Key West. Bring your bikes! The place was nice and dont judge a book by its cover the pics are exactly what u get. Theres only one thing that we didnt like about the stay that was if you have a boat with you dont plan on anyone letting you use there slip for a day everyone says its to much of a liability. And theres no slips to rent so you have to bring your boat back and forth from the ramp everyday you stay. But overall nice place and safe. And not far from key west. Glad you had a great stay Kenneth! Just so you know for the future, we do also have a property on the water property about half block away. The property number is 7520603 if you wanna look into that in the future! Hope to have you again! This was our first visit to the Keys and we were looking for a reasonably priced place with some amenities with a good location for exploring the area and this fit the bill. The unit was very clean and generally well equipped. I would have loved a hair dryer—I forgot to pack one; and an oven would have been nice for a quick pizza. Otherwise the kitchenette worked out well. This unit is small and a good fit for 2 adults; more adults than that seemed like it would have been a squeeze although a couple young kids would fit in fine. The bedroom off the bathroom with the double bed seemed too tiny so we settled on pushing the 2 twin beds together and using the large room in the add-on area. The beds were more comfortable than they looked and the bedding and pillows were good. The bathroom was small but functional. Water pressure wasn’t great in the shower but the water was hot and there is a shower building a few doors down. We just used the shower in the unit and it was fine. Our stay was 5 nights and this place worked out well for us. The resort itself was very nice and friendly. It was fun just to walk the entire complex and check out all the different trailers/condos/units. A couple things to remember is the price is lower because this unit is not on the water. There’s a canal across the street. Also, there is a busier street behind the unit that could get kind of loud with traffic during early morning and early evening times but seemed to quiet down and didn’t keep us up at night. The distance to the pool/hot tub/beach is walkable without too much effort but there is plenty of parking around the pool area. I think the description of this unit was honest and accurate.